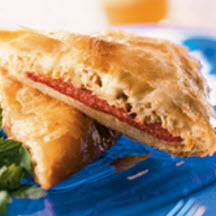 CooksRecipes has quality, kitchen-tested recipes for a variety of pastry-style sandwiches that you can count on for successful deliciousness. 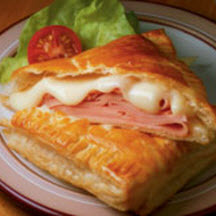 These hot and tasty homemade ham and Swiss cheese sandwich pockets are easily made with ready-to-use puff pastry squares. This recipe is suitable for heart smart, low-fat and diabetic diets. 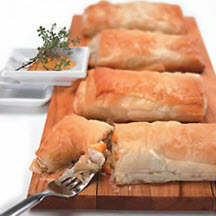 Hot and crispy sandwich pockets made with filo (phyllo) dough stuffed with creamy, earthy Camembert, tender succulent crab, and roasted red bell peppers.